My Favourite Ornamentals for Lethbridge — Hilgersom Inc.
Ohio Buckeyes are small trees incredibly hardy for our Lethbridge region. Although they prefer moist soil, they can withstand periods of drought once established in the landscape. Ohio Buckeye (Aesculus glabra) is incredibly hardy for our Lethbridge region. These trees are well suited for small yards since they are relatively slow growing with a mature size of about 8 metres tall (26’) and 5 metres wide (16’), perfect for a specimen tree in your front yard, or to be used among other trees in your backyard. I love this tree and recommend it to many of my customers because it is a four-season plant; spring features large leaf buds unfurling to display large, tropical-looking, palmate leaves. 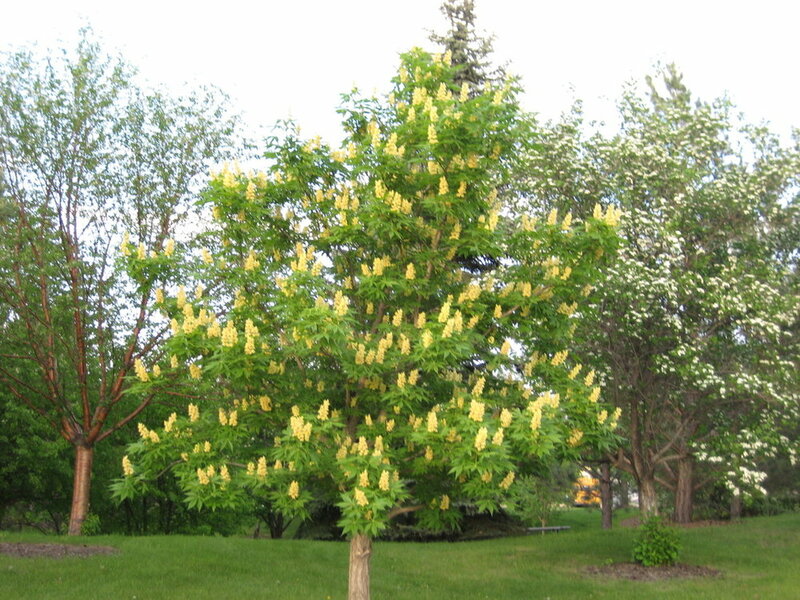 Next, the tree will begin to flower profusely as unique candle-clusters of yellowy-green flowers appear. Later in the summer, these flowers become prickly balls, slightly smaller than golf balls, that cover inedible nuts. In autumn, leaves turn bright orange before falling and again revealing the beautiful, light-grey, python skin-patterned bark, for you to enjoy during the winter. The best thing of all about Ohio Buckeyes is their ease of maintenance. Their round growth habit doesn’t require much pruning and, apart from some dropped leaves and nuts in the fall, they’re quite clean. Many of us enjoy lilacs for their beautiful and fragrant spring blossoms. However, those traditional lilac shrubs may also be remembered as a very large, tangled mass of branches with new growth suckers popping up around their perimeter — not ideal for modern landscapes. 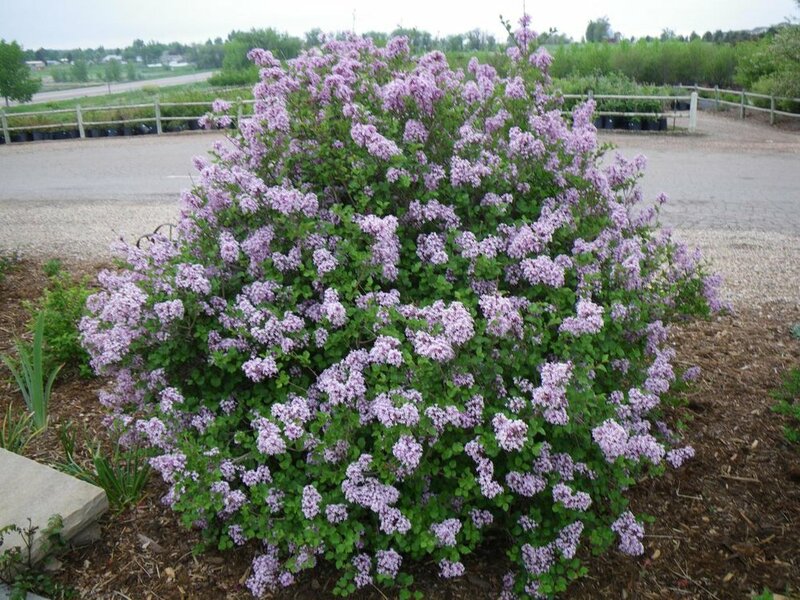 Dwarf Korean Lilac (Syringa meyeri ‘Palibin’) are drought tolerant once established. This is not the case with Dwarf Korean Lilac, though. Just like their French cousin, this smaller lilac species is still a profuse bloomer in mid to late spring, displaying masses of purple (dare I say, lilac-coloured) flowers full of beautiful spring fragrance that you and the bees will delight in. Those flowers can also be enjoyed indoors as cut flowers. However, unlike its larger relative, this species will fit nicely into most yards, even small ones. Their compact, rounded 1.5-metre by 1.5-metre (5’x5’) size makes them great to use as an informal hedge or any other mass planting. Their great shape also allows them to stand alone in most yards as a feature shrub. The fine-textured, pointed leaves of this hardy shrub are unique compared to other woodies their size, and will give this ornamental plant lasting beauty throughout the growing season. Dwarf Korean Lilac require full sun but aren’t too particular about soil type as long as the growing medium is moist. Don’t worry, though, they are drought tolerant when established, so they’ll still flourish during our hot southern Alberta summers! If you’re looking for an all-season plant for your landscape that is easy to maintain, this might be for you. Clump-forming, perennial grasses have become popular to use in our prairie landscapes in the last decade, and for good reason. They are relatively inexpensive, are easy to plant, have a uniform growth habit, and will grow quickly in most growing conditions. Overdam Feather Reed Grass (Calamagrostis acutiflora 'Overdam') is inexpensive and easy to maintain. Overdam Feather Reed Grass is among the tallest grasses used in landscaping, but a bit shorter than its popular cousin, Karl Foerster Feather Reed Grass. It does share many of cousin Karl’s great characteristics, though. Its clump form does not get out of hand and the sterile seeds will not promote spreading in the garden. The stalks and leaves are strong enough to withstand even the worst southern Alberta winds and will remain erect through rain, snow, and frost. In fact, their hoar frost-covered stalks protruding through the snowy landscape will help remind you that there is life in the garden even during the harshest of winters. Use Overdam Feather Reed Grass in a xeriscape with other drought-tolerant perennials such as stonecrop or echinacea, or mass plant them to mimic our prairie landscape. The variegated white/green leaves also look particularly striking when lit up with landscape lighting, and their feathery plumes of gold look great as an addition to a cut flower arrangement.